The Host step of the wizard is available if you have chosen to change the location and settings for the restored VM. Select a VM in the list and click Host. To apply changes in bulk, select several VMs in the list and click Host. Choose a standalone or clustered host where the selected VM must be registered. Click the button on the left of the field to select the necessary type of object that should be searched for: SCVMM, Cluster or Host. Enter an object’s name or a part of it and click the Start search button on the right or press [ENTER]. If you choose to register the restored VM on a host being a part of a Hyper-V failover cluster, you can specify additional failover settings. Select a VM in the list and click Resource. 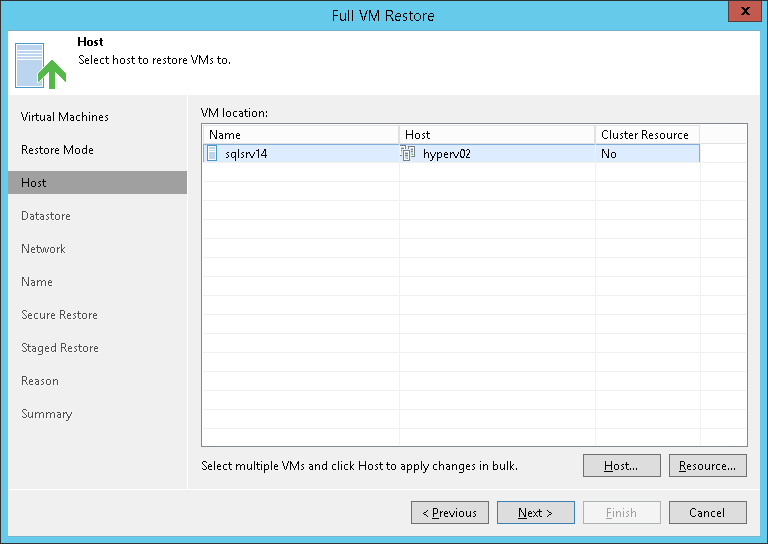 Select the Register VM as a cluster resource option if the restored VM must be configured as a cluster resource. In this case, if the target host is brought offline or fails for any reason, the VM will fail over to another node in the cluster.